Today’s ride: Storming of Thunder Ridge (SOTR) is a ride onto the Blue Ridge Parkway from Lynchburg VA. This is a very challenging ride, the highlight of which is a 13 mile climb and a long descent, including a winding technical descent that is a challenge to any rider. Of all the rides I’ve done, I count this one among the most difficult. A 13 mile climb is a challenge for the body and mind alike. This is a ride for climbers. If you want to ride SOTR, spend a couple of months training in the hills. Be prepared for a challenge. You will suffer. This can be a good thing. However, a rider is rewarded by awe inspiring scenery on this ride. This is a ride to be proud of finishing! One thing this ride gives you is good mementos: this year we received a pint glass in addition to the usual shirt and optional jersey, which were excellent designs. There were snacks, a vitamin sample, a tote bag, and even a sample of chain lubricant. Nobody goes home from SOTR empty handed! The Experience: My ride up Thunder Ridge started with an innocent email from my friend Ron, who said “What do you think of this one?” with a link to SOTR. Being a good friend and generally more enthusiastic than analytic, I agreed to sign up. I was told that the climb averaged 6% and was a challenge. Okay. I can ride a 6% climb. Later I was to discover that the word “average” would prove to be a baited hook to reel me in. Before the ride we managed to get a day trip to the Skyline Drive in Front Royal, VA to do some practice climbs. Skyline measures climbs in miles as well, and they tend to be steeper than 6% with distances up to 4 or 5 miles. My partners in crime for this adventure were Ron Tripp and Deb Reynolds. Ron is a good friend and my partner in crime for many of my riding adventures. Deb is a cheerful woman who finds difficult rides and makes light of them. She has a gift for understatement. I discovered that SOTR was her idea. 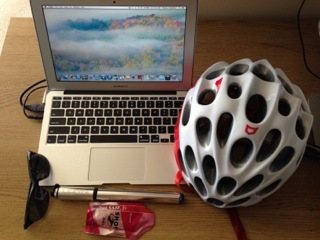 I rode well on Skyline, and felt prepared for SOTR the following weekend. The next week I started a new contract at work. I picked up a kind of flu bug, possibly on the subway, and was sick as a dog all week. By SOTR I was over the worst of it, but still recovering. This was not encouraging, but I’m a stubborn man. I headed off to Lynchburg. The evening before the ride was also an adventure, navigating between two hotels and searching the backroads of rural Virginia in vain for a phantom Italian Restaurant for Deb. We eventually found one for her, but the search was a comedy routine with 3 people acting as the “straight man” for a comedic GPS unit. The morning of the ride we arrived in time, found parking, and got going a little before the group start in order to find some open road. The first 20 miles to the rest stop included some short punchy climbs to warm us up. I was feeling more drained than usual, but I was determined to see it through. 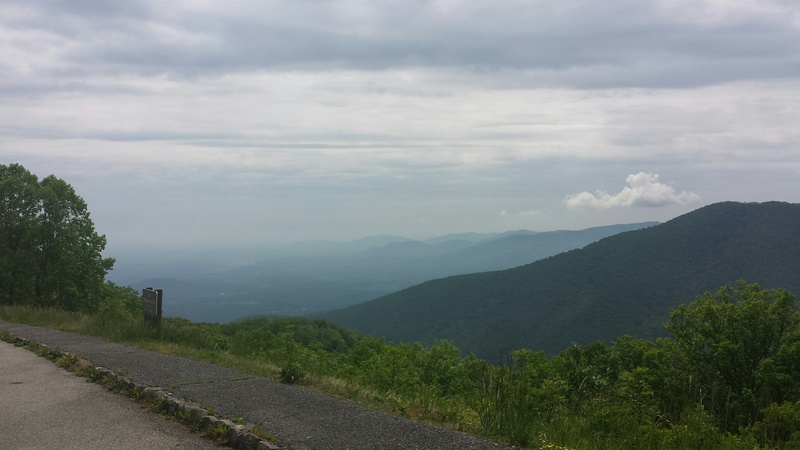 Thunder Ridge was ahead of us, and the climb up the Blue Ridge Parkway was heavy on my mind. The climb started at mile 25. Remember when I mentioned “average grade”? the lower slopes were very easy – perhaps only 3 or 4 percent – which is not hard to climb. We were spinning at the bottom thinking that a 6 % grade wasn’t going to be too bad. The problem is that when you factor a mile of 3-4% grade into your calculation of “average”, it leaves room for quite a bit of 7 and 8% grades nearer the top, and I’d heard others talk of places where the grade went up to 11% near the top, and I believe them. a 13 mile climb is a challenge to the mind as much as the body. When you’re riding uphill for two hours, you know that your legs will ache, but your mind has to keep your legs working, and the concentration required narrows your world to the pain and a small bubble of awareness of your surroundings. I’ve heard it called “the pain cave” and it is a very dark place. By the top, I was deep in the pain cave, and I didn’t have much light to see by! Despite this, there was a lot to see. The higher you get, the better the scenery around you. The Blue Ridge is a beautiful place, and the scenery was incredible, when I could look past the pain enough to appreciate it! There were other compensations. I was buzzed by butterflies all through the climb. They stuck in my memory of that climb – little sparks of grace and beauty flying past me while I toiled in the pain cave. Some had black wings, others had black forewings and blue back wings, and others were all yellow, but each one was a welcome distraction. There is a rest stop halfway up the climb. Ron was climbing much better than I was, and he went ahead. It was clear by this time that being sick the week before was having it’s effect on me. Still, he was there at the stop to encourage me, and I took on needed calories and water. The rest of the climb was steeper and tougher. I wasn’t climbing fast by my estimation, but I was passing a lot of riders at this stretch of the climb. There were a lot of riders who stopped during the climb at the roadside – I wasn’t sure if I pitied them their pain or envied their rest, but I kept going. I just wanted to climb steadily. I’m a large man as bike riders are usually measured, and pushing a big body uphill takes a lot of effort. I didn’t want to stop, because I’m stubborn. In the last 3 miles of the climb, the organizers planted two signs. The first read “You’re a climber now!” and I thought that nobody looking at me would ever guess I was a climber. The second read “Shut up, legs!” a catchphrase from bike racer Jens Voight; I thought of him and refocused. 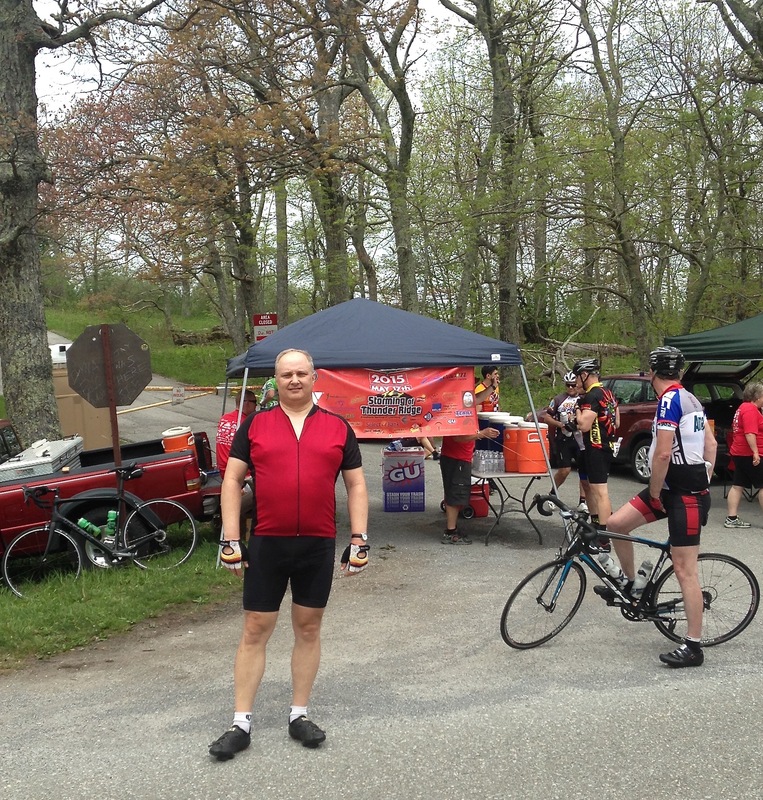 There is a rest stop at the top of the climb – riders reach it hearing the volunteers cheering. You know that you’re done with the climb at that point, but not with the ride. What follows is a long descent – I was thinking that I was traveling at 5 times the speed at which I climbed – and after that, there was a technical descent on a winding road to the valley below, but the climbing wasn’t done. There remained some short, punchy climbs to conquer. My energy and my legs were used up on Thunder Ridge however, and I started to fall back on the climbs. At 64 miles there is a stop, and you can either take the century course or the 77 mile ride back to the start. I was determined to do the century, but my partners urged me to shortcut it back. In the end, the decision was made by a bad cut in my front tire. I went back to the start with another PPTC friend, Matt Birnbaum. The climbing wasn’t done – Matt had a GPS, and informed me that one climb we did was 15% – which is quite steep, and it was long enough to hurt again, but I rode in strong to the finish despite the pain and my worrisome tire. Later I would find out that I had a wheel issue too. I’m having them rebuilt. I had made the right choice. I reached the finish feeling satisfied. I’d overcome a lot, and I’d made it up Thunder Ridge without stopping anywhere but the rest stops. Now I’m determined to ride it again next year, if only out of a stubborn masochistic need to prove that if I’m in my normal condition instead of recovering from illness, I can spend a little less time in the pain cave, and enjoy the ride even more! Selections from my mental iPod during the ride: “One Night in Bangkok” by Murray Head, “West End Girls” by The Pet Shop Boys, and “If Venice is Sinking” by Spirit of the West. Stats: 77.62 Miles ridden. Now that I’m out of the pain cave, it feels like a triumph! I’ll come back next year and bring more friends with me! At the Top of Thunder Ridge – ready to descend for a change! Blue Ridge View – photo courtesy of Deb Reynolds. 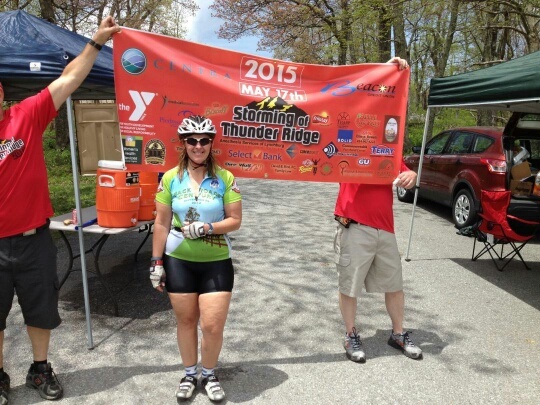 This entry was posted in Cycling, Front Page and tagged century, Cycling on May 31, 2015 by kitefencer.